Looking for a way to stay on task and keep track of your homework? MyHomework is an application used to for keeping track of various assignments for all different classes. Keep track of your homework by adding your classes and homework assignments as well as their due dates. Organize your schedule, get ahead on tasks and studying, and cross whatever you get done off that checklist. 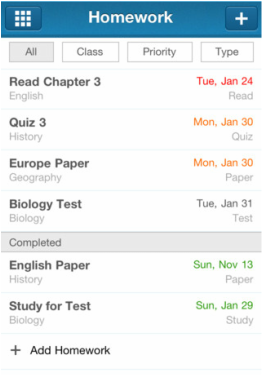 MyHomework will increase both your productivity and organization in school. Available for both mobile and desktop environments (iOS, Android, OS X, Windows).